Ubu Gallery presented an exhibition of manipulated and un-retouched photographs, as well as the photomontages, by Pierre Molinier, an influential French gender performance artist. Although he had begun photographing himself seriously as early as 1950, Molinier created an obsessive photographic documentation of his private “male lesbian” fantasies in the mid-1960s. 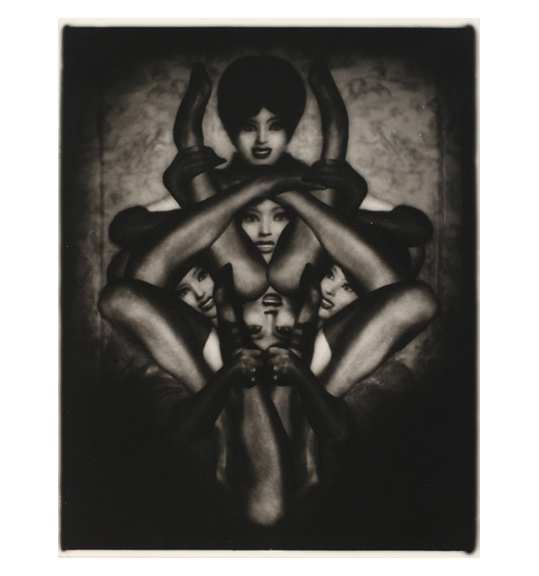 These images were “recycled” in the late 1960s as source material in the elaborate and sensual photomontages, which he created during countless, painstaking hours in the darkroom. There he manipulated parts of photographs in order to produce new seamless “unreal” realities, which reflected his fetish obsession with legs, stockings and hermaphroditism. Through these photomontages, Molinier was able to invent new desires and realize previously unfulfilled ecstasies. Working simultaneously and in collaboration with this exhibition, Wooster Gardens held an exhibition of Pierre Molinier’s collages.